Our next stop on our whirlwind brewery tour of Southern California was at Stone Brewing Company in Escondido, CA. Still shimmering-new, Stone's facility and adjacent gardens is quite a marvel. I think one of us likened it to the Disneyland of Breweries. We had originally planned on taking the tour, but since we spent longer than we planned at Lost Abbey, we missed our shot at the one at Stone. That gave us the opportunity to sit down, relax and have a late lunch and a few beers. Even though CEO Greg Koch was out of town attending the Beer Blogger's conference in Denver, he graciously agreed to answer a few questions via email. You can read the full text of the interview below. When the weather is nice, the doors are opened and seating is expanded to the outside next to the gardens. Looking in from where we were seated outside, you can just barely see the large brewtanks behind the glass at the back. The center of the gardens on the Stone grounds. Looking back from the gardens at the building. John Kleinchester, beertography.com: We also visited Lost Abbey/Port Brewing in San Marcos and they explained to us about how they occupy your former building. What was it like moving from the old location to the new? Greg Koch, CEO Stone Brewing Company: Exciting! For years we’d struggled to work within the confines of a series of suites in the old building (we grew to 24,500 sf in that building…the Lost Abbey brewery is in our original 7100 sf), so we were stoked to be able to design and build a space that was to our specific design. JK: And how did it come about that they were the ones to take the spot? GK: We’ve been friends with those guys for a long time. We let it be known that the brewery was available, and they responded. We worked together to come to a mutual deal…and the rest is history! JK: The brewery/bistro site is more of an experience than most other breweries I've visited. Do you foresee the future European Stone location as being something similar? GK: Well, “similar” in that it will be different and eclectic with its own unique personality, yes. It’s our goal to create something that will hopefully grow to be as special as what we have here in Escondido. JK: Has the bistro always been about local/natural/organic ingredients (i.e. no high fructose corn syrup in the sodas) or is that something that changed at some point? Will the new European location would follow the same model? GK: We set those standards from the very beginning of the restaurant. When we decided that we wanted to open a restaurant, I started researching food and the food system we use here in the US. It’s pretty messed up IMO, and I came to the conclusion that I could not in good conscience be a part of the commodity food system. Thus, the decisions that we’ve made. Yes, we will use similar ideals in Europe if we open a restaurant at the brewery location there. Thanks to Greg for the interview and if you're headed to the San Diego area, I recommend you take the short drive out to Escondido so you can experience this little beer oasis for yourself. 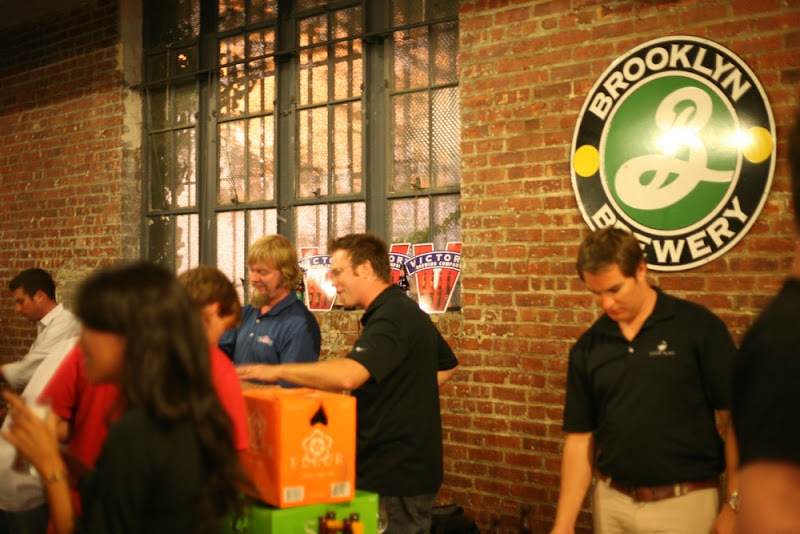 Stay tuned for Part III featuring Ballast Point and Green Flash Brewing companies! America didn't just repeat as producers of the world's worst beer, we increased our margin of victory by 7 points (in a new survey of 3,400 respondents from 99 countries). Hard to say if American beer is getting worse, or the rest of the world's beer production is improving. Or, perhaps our reputation is simply spreading. 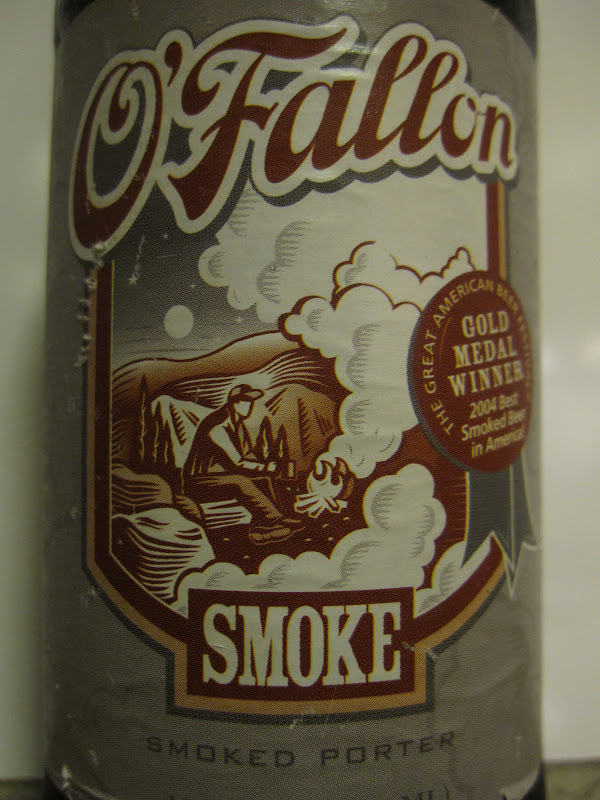 As the long-standing joke goes: What does American beer and making love in a canoe have in common? Both are amazingly close to water. This is just idiocy for many different reasons. Firstly, its a survey of 3400 people in 99 countries. So basically a TINY amount of people asked what they think of beers in different countries. 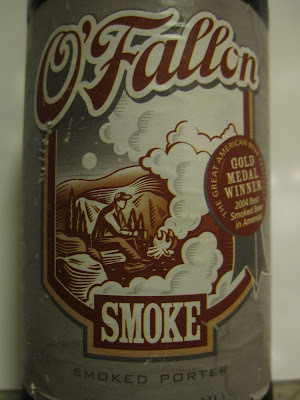 No chance that a majority of them even know that the good beer in this country is on the upswing. In fact, I'd even guess that this was just an opportunity to knock America because of general declining opinions of us as a nation. Terrible. Then again, there's also the possibility that the rest of the world's palettes are finally refining and realizing that we mass-produce a ton of terrible Light Adjunct Lager... But those same people should realize that our craft market share is growing, and technically Budweiser, "The Great American Lager" isn't even American owned anymore. On top of all of that, if you look at the photo for India (seen above) it has a freaking flight of Dogfish Head. What in the hell? Did they think Dogfish Head India Pale Ale is from India? Someone tell them its made in the beautiful state of Delaware. Any way you look at it, this is an entirely worthless article... You're welcome for sharing it! Its been a while since our last check-in with Barcade's new downtown Jersey City location. I decided to walk by on my way home from work yesterday and was happy to find that work on the place is starting to shape up. The photo above was taken through their front door. It looks like we're seeing the beginnings of a bar perhaps? Also, even though it was already mentioned that this Barcade location would also be serving food, I was excited to see that the permit taped to the window listed work being done on a "food prep area". Awesome. One other thing I noticed was another permit stating that nothing would be allowed closer than 5 feet to the curb. I'm assuming this means that there will indeed be outdoor seating available here, which is a great addition. It looks like the opening is in sight and I for one cannot wait. Earlier this month I flew to Los Angeles to visit some friends and attend the second-ever show of Conan on TBS. And what's a vacation without cramming in as many breweries as possible? San Diego and its surrounding area is chock full of awesome breweries, so I convinced LA friends (and future purveyors of West Coast Ten Dudes Brewery operations) Ian and Josh to do a road trip with my up-and-coming-hop-head girlfriend Tash and myself. Team Beertography gearing up for our first beers of the day. Our first stop on our route from Los Angeles to San Diego was The Lost Abbey / Port Brewing in San Marcos, CA. Until planning this trip, I hadn't realized that Lost Abbey and Port were one in the same. Another interesting fact we learned was that this building was actually Stone's old facility until they moved to their brand-new state-of-the-art one in Escondido, CA. Look at that wonderfully huge list of beers. Having only had 1 or 2 Lost Abbey beers ever before, it was a real treat ordering half pints of as many beers as possible. The tables are barrels. THE TABLES ARE BARRELS! FACT: Every brewery needs a cat. Staggering amount of barrels, all funkified. It was light headed-ness inducing. Sage, our awesome tour guide shows Ian the working of the bottling line. Everything at the brewery is crammed in at the moment, but that's only because they just bought the building next store and have just begun expanding into it. He also took us across the street where they have even MORE barrels. Like, hundreds upon hundreds of them. They're the barrel kings. Not only did they gain their building from Stone, but this fermentation tank was shipped from Delaware by a dude named Sam Calagione (you may have heard of his new TV show, BrewMasters). You gotta love all of the collaboration and sharing that goes on in the beer world. Special thanks go out to Terri and Sage who hooked us up with a fantastic private tour and also some limited-run beers in their "Hop Tea" series. I believe we got to try the Tea 4 and Tea 5 which were fantastic. Stay tuned for Part II featuring Stone Brewing Company. 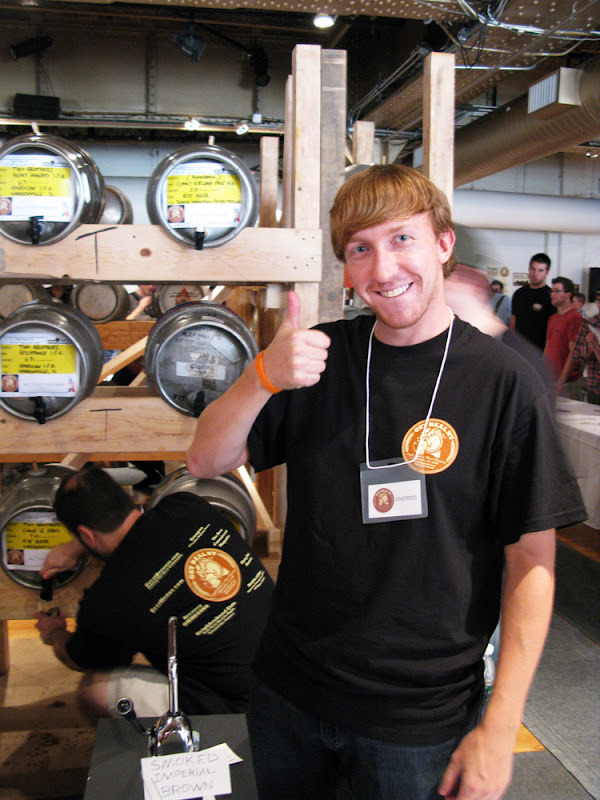 This past weekend, a few of NYC's brightest beer minds, Patrick Donagher (Rattle'n'Hum), Alex Hall (Gotham Imbiber), Mary Izett (Ale Street News) and Chris Cuzme (MBAS/NYCHG) came together to put on what turned out to be one of the largest Cask Ale festivals ever in the United States. That's a pretty tall order. But much to their credit, three sold out yet manageable sessions proved that they pulled it off. A sampling of the casks available. Wandering Star (bottom right) is Alex Hall & Chris Cuzme's future commercial brewery! I remember Patrick telling me about this festival a few months ago when it was merely an idea. He had held miniature cask festivals at his bar Rattle'n'Hum a few times already in its first two years of existence, but he was looking for something bigger and better. Patrick knows his stuff, so I knew I'd be attending whatever he ended up planning. Skip ahead to August 21st. One of my two homebrewing partners Jeff runs into Mr. Chris Cuzme at Brooklyn Kitchen, where they have a very good selection of homebrew supplies. They get to talking and Jeff mentions how we'd done well in recent NYC homebrew competitions and Chris invites Jeff to participate in the homebrew section of Get Real NY. Boom! We're in. After getting a ride with our kegs from the generous Mary Izett, we arrived at The Altman Building at exactly 8am on Saturday. We immediately went to work hauling firkins around, putting up signs around the neighborhood and transporting glassware & shirts from Rattle'n'Hum. In what seemed like a blink of an eye, the guys had transformed this beautiful room into a full-fledged cask ale paradise. Granted it didn't quite open at the scheduled 12:00 start time, but it wasn't too much of a delay (and the session went later than 3 to make up for it). The next 9 hours were a whirlwind. 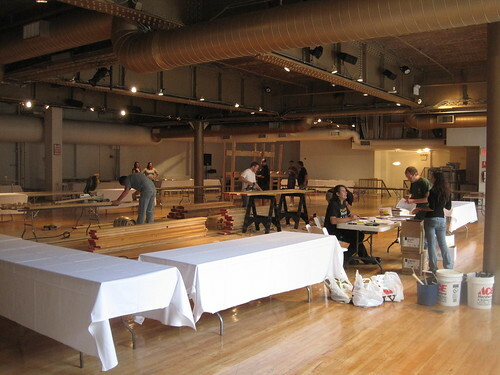 Before we knew it we were donning Get Real shirts and setting up our homebrew kegs-turned-casks. 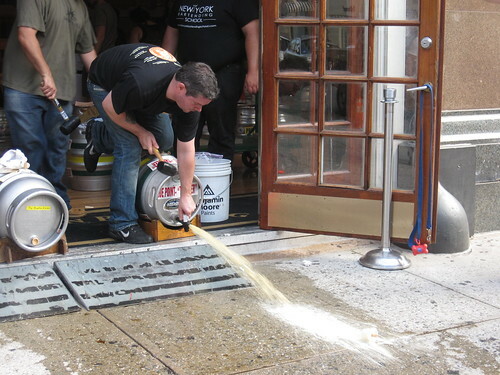 Just as the last firkins were put into place, the first patrons were let through the door. 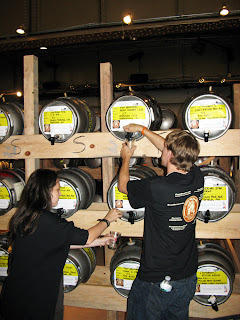 I had never actually poured my own cask ale before, and we weren't really given a tutorial so a few volunteers sprayed themselves with some of the beers that hadn't quite settled yet. I was also a victim myself later on. One thing I did learn however, is that I really enjoy serving people beer. And it was particularly fun when people would come up and ask for whichever one was my favorite, which gave me a good challenge. 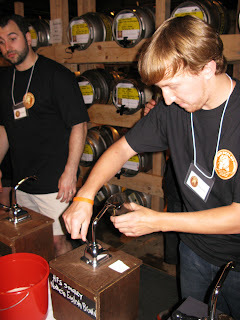 Of course, the ultimate experience here was pouring our homebrew for people. And yes, sometimes when people asked for our favorites we gave them ours. How could we not? We got a lot of positive feedback, especially for our Smoked Imperial Brown, or "Bacon Robot beer" as some people were calling it. Two people claimed it was their favorite at the whole festival. Maybe they were drunk or maybe they were just being nice, but either way it was very encouraging. Must. Brew. More! The pouring box on the left was designed and built by Chris Cuzme. The one on the right was actually put together by Jeff and myself (mostly Jeff). He had an old subwoofer lying around that wasn't being used anymore, so we drilled a hole in the top and were able to have music play out of the front at the same time as pouring our beer! 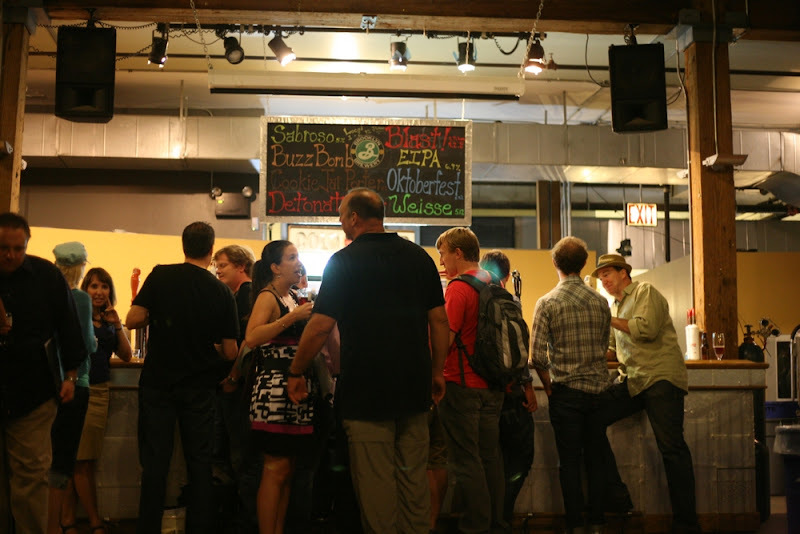 It was a bit too loud at the fest to utilize the speaker, but next time we throw our own cask party.. This is what happens to cask ale that doesn't get drunk. Yeah. Cry time. After the last session ended at 8:00 on Sunday night. Everyone cleared out and it was obvious that there was still a LOT of beer left. A LOT. But in case you weren't already aware, cask ale doesn't last very long. That's all part of the "real-ness" of it. Especially the ones that were lower in ABV. So the end result was a river of beer unlike anything I've ever seen. The smell of beer permeated the block and eventually attracted a few people wondering what was going on. This guy actually ran down the street to get a container to capture some of the beer. Not that I blame him, I would have done the same thing. It took about 3 hours or so to break everything down and load up all of the firkins. At this point I was a bit delirious from spending around 20 hours on my feet during the 2 day fest. Jeff took the opportunity to show his exhaustion on the newly cleared Altman Building floor. Except this last one. That Jeff had to keep on his lap as we drove back to Rattle. All in all, Get Real was a blast. Tiring as hell? Yes, but it was worth it for the experience. 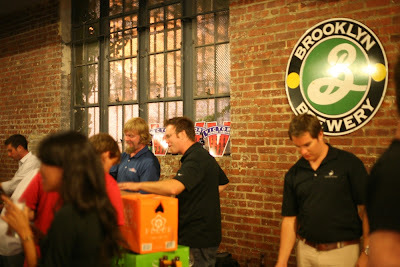 Great people, great atmosphere and of course great beer. Here's to the next one! Recently I had the pleasure of being interviewed by the infamous Beer Wench! What are you waiting for? Go check it out now! 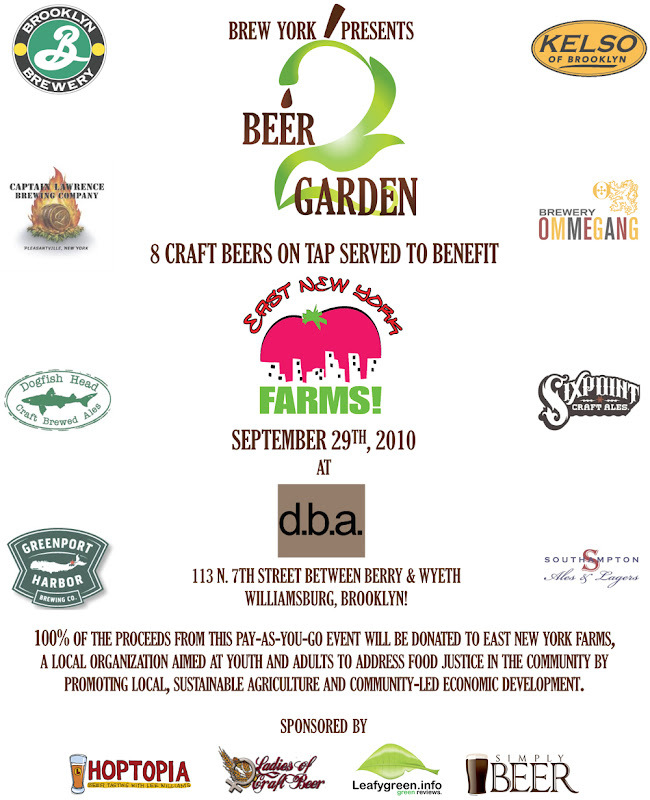 Beer2Garden - Drink For Charity This Wednesday! So come out and support a great charity by abusing your liver! Just for the record, The Village Pourhouse is not a craft beer bar. Yes, it may have a few craft beers on tap and in bottles, but they are not a craft beer bar the way Rattle'n'Hum, Barcade or The Blind Tiger is. You may already know this, but I didn't know for sure until last night. I had received an invitation for an hour-long open bar at the new Village Pourhouse location in the Theater District (recently converted from the previous "Joshua Tree" but not changed at all on the interior). We would like to extend an invite to all Crossroads Cardholders to join us on Tuesday, September 21st to sample a selection of 100+ craft beers and appetizers. Open beer bar & appetizers followed by an Extended Happy Hour just for cardholders in the Upstairs Dugout & Redlight Room until 8:00pm featuring 2 for 1 Vision Vodka Cocktails, 901 Margaritas, Jim Beam Black & Cokes and Cruzan Rum Cocktails. Okay, so an hour open bar where you get to "sample a selection of 100+ craft beers". Sounds good to me! Guess what we were offered when my coworkers and I got there? Free Bud, Bud Light and Well Drinks only. Nice! Budweiser is craft right? Oh. Well, at least its American, right? Oh wait, nope. Not even American anymore. Damn. Now I know what you're thinking; waaaaaaaaaaah I'm complaining about free drinks. But come on, they advertised sampling over 100+ craft beers! By the way, I don't even know where they keep these supposed craft beers. 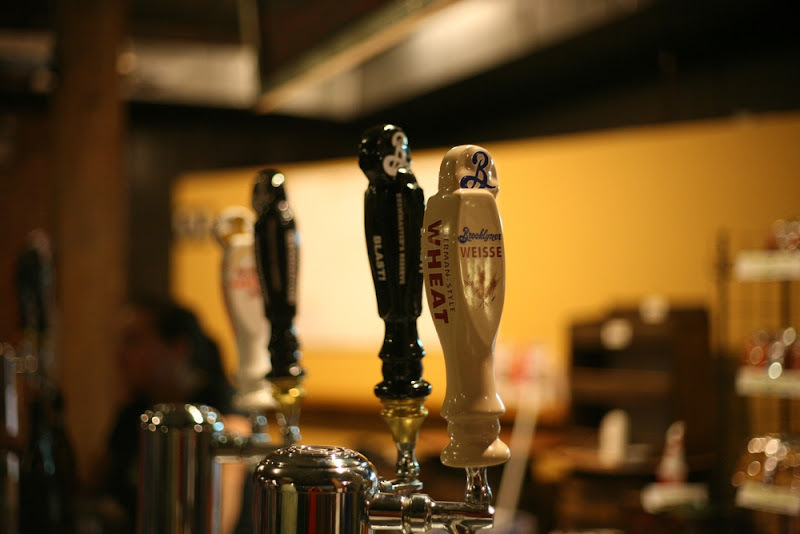 The crafts on tap were Brooklyn Pilsner, Goose Island 312 and IPA (both distributed by Budweiser /nitpick), Sam Adams and Kelso Nut Brown. 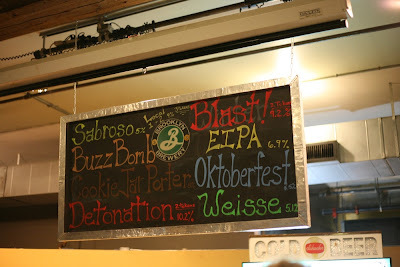 There were also a few spotty bottles of craft beers including Smuttynose Robust Porter. But of course, none of those were included in the "Open Beer Bar". Later we discovered that upstairs where the appetizers were disappearing in nanoseconds (nope, didn't get any of those) there were taps of Bud Light and Stella Artois. So I dropped $6 + tip on a Kelso Nut Brown and then had free well drinks for the hour. 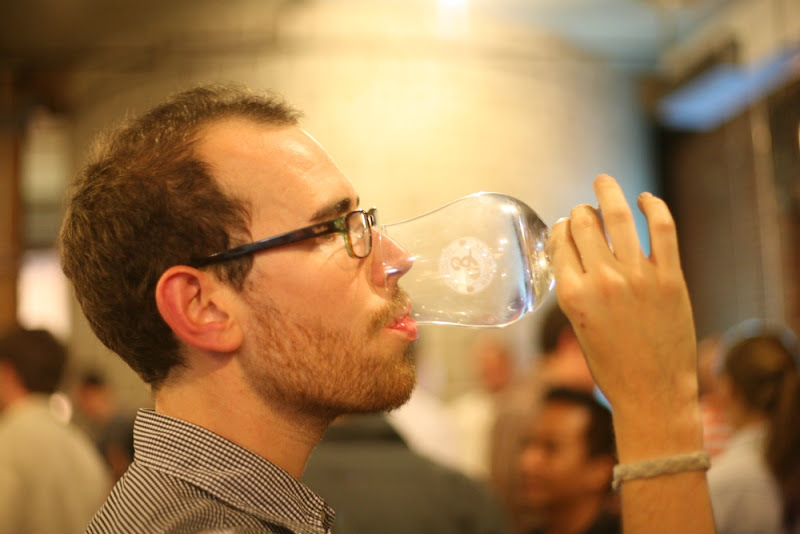 I've been to the Village Pourhouse downtown a few times and had similar results. Once for a sampling of Sam Adams Utopias, where they ran out before I got there and was told by the bartender: "that's okay, its disgusting anyway". All in all I probably spent $12 or so after tipping for the well drinks, and I'm okay with that especially since six of my dollars went to Kelso. But it seems to be a new trend in bars (and stores) to advertise yourself as having craft beer but then not really delivering. 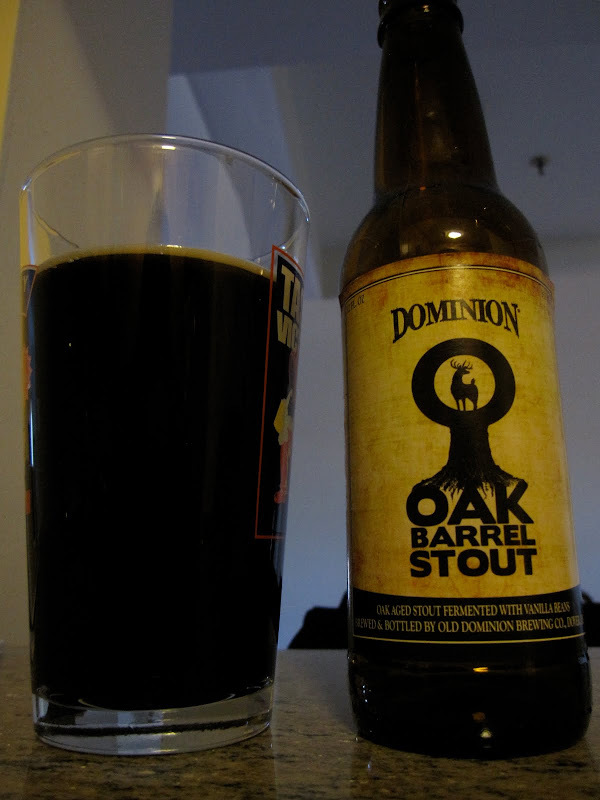 Its all a little unnerving for those of us trying to advocate craft beer. 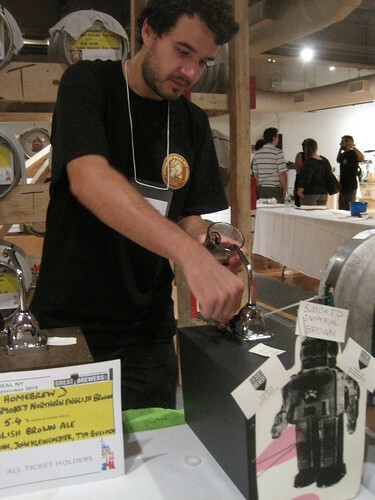 Get Real NY Craft Beer & Food Festival - This Weekend! Clear your calendar for this Saturday and Sunday, the first ever Get Real NY Craft Beer & Food Festival is this weekend! With 2 sessions per day, this is bound to be THE beer event of NY Craft Beer Week. 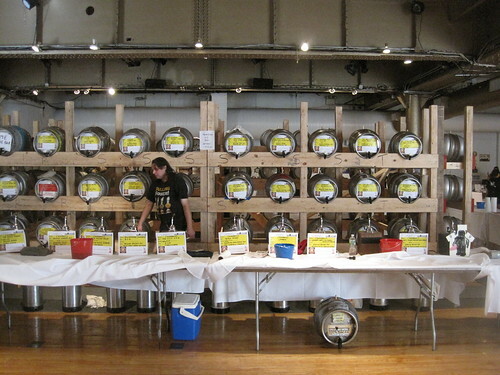 Plus, where will you ever be able to find this much cask beer in one place? PLUS! If you buy your ticket TODAY through Groupon.com, you can save 54% off the retail price! CLICK HERE to get your ticket NOW! There's even going to be a homebrewers section, featuring yours truly & the Ten Dudes brewing team! Come check out two of our latest brews, served on cask for the first time ever! Okay, now that we have that out of the way, how about a few more details? The festival is being put on by some great folks from the NYC beer community: Patrick Donagher - owner of Rattle'n'Hum, Mary Izett - certified Beer Judge & columnist for Ale Street News, Alex Hall - CaskMaster Extraordinaire, Gotham Imbiber and the man who has been educating all of New York on the wonders of Real Ale for over 7 years, and Chris Cuzme - President of the Malted Barley Appreciation Society & Assistant Director of NY Craft Beer Week. Dr. Bill Sysak - Stone Brewing Co.
David Yarrington of Smuttynose Brewing Co.
Jeff Jerman of Troegs Brewing Co.
Chris Wilson Weyerbacher Brewing Co.
Bill Covalski of Victory Brewing Co.
Evan Klein Barrier Brewing Co. So what the hell are you waiting for? Those $30 tickets go bye-bye tonight at Midnight. Get on it! Get REAL! Here's one of the best photos of craft beer I've seen in awhile. 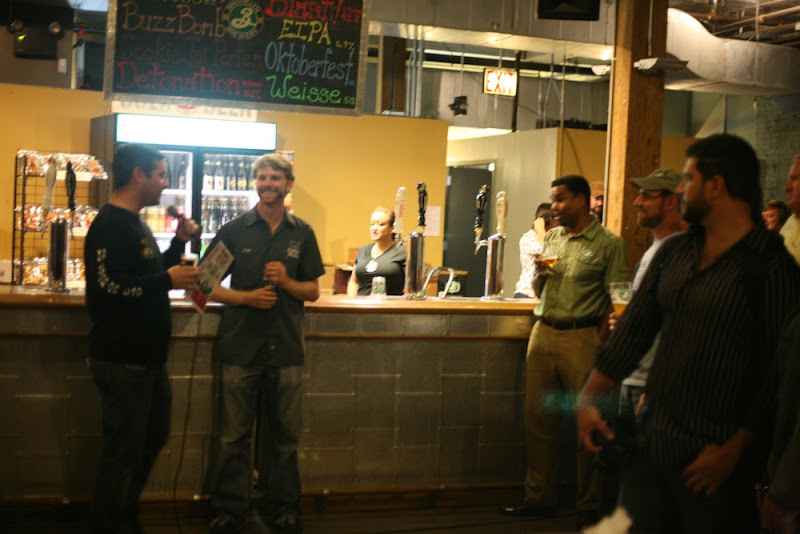 It comes to us from Mike Sweeney of stlhops.com, the premiere website for craft beer and homebrewing in the St. Louis area. Definitely check out his site! 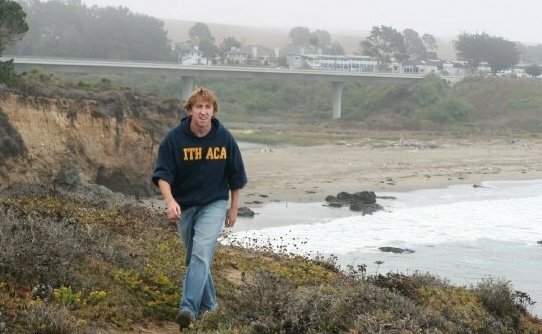 You'll notice his great photo is now a prominent part of the blog, and rightfully so. 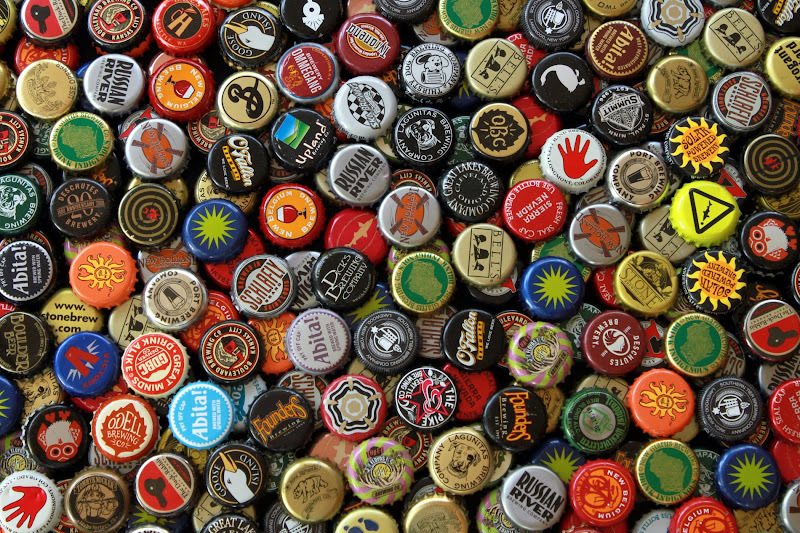 Its quite the impressive collection of caps too, mine dwarfs in comparison. Make sure you click on the photo to see the high-res version. 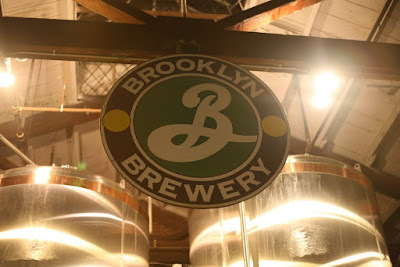 Wednesday Night, the minds behind NY Craft Beer Week threw a Press Preview Party at the Brooklyn Brewery in Williamsburg. This was a sort of a pre-launch party to get people talking about the week-long celebration of suds where all kinds of craft beer and artisanal food will be served all across the 5 boroughs from September 24th - October 3rd. Photography help provided by the illustrious Jeff Quinn. Patrick Donagher, owner of Rattle'n'Hum and founder of the Get Real NY Cask Ale & Real Food Festival talks about his fest as NY Craft Beer Week Director Josh Schaffner and Brooklyn Brewery Brewmaster Garrett Oliver look on. The large crowd packed the brewery's walls and even got a sneak peak into the new facility next door that will soon house an expanded amount of fermentation equipment. For details and photos of this space, check out this post on the great beer blog Brew York, New York. Brooklyn's offerings for the night, all on tap. 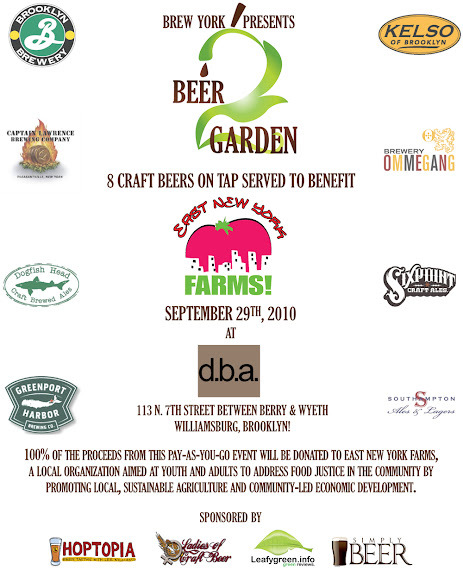 Also available that night were beers from Founders, Victory, Allagash, Cigar City, Captain Lawrence, Goose Island and Coney Island brewing companies. 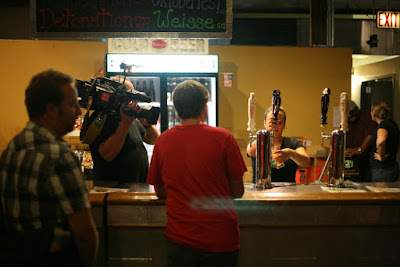 There's me ordering a Detonation Ale and wondering if I'll end up on TV. Both News 12 Brooklyn and CNBC had cameras capturing the evening. Check out the new design for the Brooklyner Weisse tap handle! Pretty awesome. Here we have newest Brooklyn Brewery employee Tim Bullock celebrating his first long, hard day of work with a beer. It almost looks like someone else's hand is feeding Tim the beer. The beer-celebrities were in full force! Here we find Mr. Bill Covaleski, owner of Victory Brewing Co. along with his NY/CT Sales Rep Sean McCain, pouring samples of Saison Du Buff and Prima Pils. The last few stragglers crowd the bar for one last drink before we were shooed out. All in all, it was a great time with delicious food and excellent craft beer from all over. The lesson here? GET EXCITED FOR NY CRAFT BEER WEEK! Its only a mere 2 weeks away. 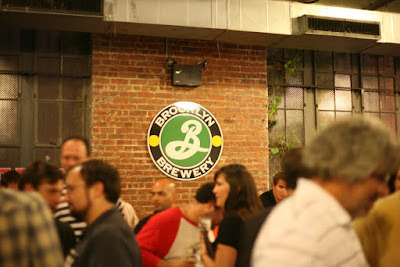 Get over to NYCBeerWeek.com and buy your passport today!